The president has announced a reset of the government. 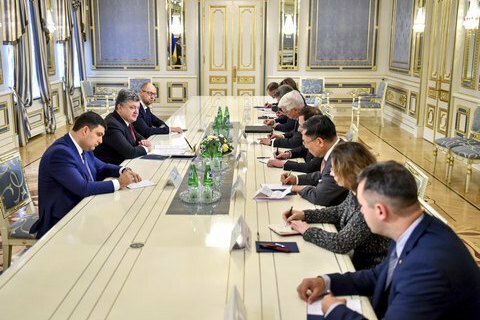 President Petro Poroshenko has told the ambassador of the G7 countries and the EU that he is resolute about continuing reforms. "For this we need to reset the government as soon as possible. According to Petro Poroshenko, the reformist ministers and their teams must stay," Poroshenko's website reads. The diplomats said it was important that the Ukrainian leaders remain united, it added. The sides also discussed the implementation of the Minsk agreements. President Poroshenko, Prime Minister Arseniy Yatsenyuk and parliament speaker Volodymyr Hroysman met the ambassadors to demonstrate their unity after Economic Development Minister Aivaras Abromavicius's resignation over the actions of MP Ihor Kononenko, a close friend of the president. The diplomats demanded that Ukraine implement the IMF programme to be able to receive financing from the Western donors. Ukrainian premier says minister's resignation "desertion"